Isothiocyanates are derived from the hydrolysis (breakdown) of glucosinolates—sulfur-containing compounds found in cruciferous vegetables. Cruciferous vegetables contain a variety of glucosinolates, each of which forms a different isothiocyanate when hydrolyzed. Isothiocyanates, such as sulforaphane, may help prevent cancer by promoting the elimination of potential carcinogens from the body and by enhancing the transcription of tumor suppressor proteins. Epidemiological studies provide some evidence that human exposure to isothiocyanates through cruciferous vegetable consumption may decrease cancer risk, but the protective effects may be influenced by individual genetic variation in the metabolism and elimination of isothiocyanates from the body. Glucosinolates are present in relatively high concentrations in cruciferous vegetables, but cooking, particularly boiling and microwaving at high power, may decrease the bio-availability of isothiocyanates. It has been known for some time that eating cruciferous vegetables, such as broccoli, cauliflower and cabbage, can help prevent some forms of cancer, such as breast cancer, but the mechanism was unknown until now. According to ScienceDaily.com (Dec. 29, 2008), U.C. Santa Barbara scientists have shown how the healing power of these vegetables actually works. Their research is published in this month’s journal Carcinogenesis. Other studies have shown that cooking can significantly decrease the bio-availability of the cancer-fighting compounds in these veggies! Broccoli and other cruciferous vegetables contain compounds called glucosinolates, the compounds found in cruciferous vegetables that give them their unique taste. Isothiocyanates are some of the biologically active hydrolysis (breakdown) products of glucosinolates, which according to many studies have cancer-preventive and anti-carcinogenic activities. Broccoli and broccoli sprouts have the highest amount of the isothiocyanates. One of these compounds, called sulforaphane (SFN), inhibits the proliferation of human tumor cells by a mechanism similar to the way that some anticancer drugs work – by inhibiting cell division during mitosis (cell division) and is much less toxic than drugs. 3-day old broccoli sprouts are concentrated sources of glucoraphanin, which contain 10-100 times more glucoraphanin by weight than mature broccoli plants. Broccoli sprouts that contain 73 mg of glucoraphanin (also called sulforaphane glucosinolate) per 1-oz serving are available in some health food and grocery stores. Remember, glucosinolates are water-soluble so cooking just a few minutes can decrease the glucosinolate content of cruciferous vegetables as much as a 59%. Cooking can also inactivate myrosinase, the enzyme that catalyzes glucosinolate hydrolysis into isothiocyanates, which has been shown to substantially decrease the bio-availability of isothiocyanates. Cruciferous vegetables like broccoli, cabbage, and kale are rich sources of sulfur-containing compounds called glucosinolates. Isothiocyanates are biologically active hydrolysis (breakdown) products of glucosinolates. Cruciferous vegetables contain a range of different glucosinolates, each of forming a different isothiocyanate when hydrolyzed. For example, broccoli is a good source of glucoraphanin, the glucosinolate precursor of sulforaphane (SFN), and sinigrin, the glucosinolate precursor of allyl isothiocyanate (AITC) (2). Watercress is a rich source of gluconasturtiin, the precursor of phenethyl isothiocyanate (PEITC), and garden cress is rich in glucotropaeolin, the precursor of benzyl isothiocyanate (BITC). Currently scientists are interested in the cancer-preventive activities of cruciferous vegetables that are rich in glucosinolates and isothiocyanates (3). Myrosinase, a class of enzymes that stimulates the hydrolysis of glucosinolates, is separated from glucosinolates in plant cells (4). When cruciferous vegetables are chopped or chewed, myrosinase interacts with glucosinolates and releases isothiocyanates from their precursors. Proper chewing of raw cruciferous vegetables increases glucosinolate contact with plant myrosinase and increases the amount of isothiocyanates absorbed (5). Isothiocyanates are bound to glutathione during digestion tghanks to a family of enzymes called glutathione-S-transferases (GSTs), as well as mercapturic acids. These isothiocyanate metabolites can be measured in the urine and are strongly related to dietary intake of cruciferous vegetables (9). There is also evidence that isothiocyanate metabolites contribute to the biological activity of isothiocyanates (3, 10). Bio-transformation enzymes are important to the metabolism and elimination of a variety of chemicals, including drugs, toxins, and carcinogens. These enzymes catalyze reactions that increase the reactivity of hydrophobic (fat-soluble) compounds, increasing water solubility and promoting elimination of these toxins from the body (11). Some carcinogen precursors require bio-transformation by enzymes in order to become active carcinogens capable of binding DNA and causing mutations. Inhibition of specific CYP enzymes involved in carcinogen activation inhibits the development of cancer in animal models (3). Isothiocyanates have been found to inhibit carcinogen activation by CYP enzymes in animal studies (12, 13). Cell culture studies have also shown that SFN inhibits certain CYP enzymes (14). A small clinical trial in smokers found evidence that consumption of 170 g/d (6 oz/d) of watercress, which is rich in the glucosinolate precursor of PEITC, decreased the activation of a procarcinogen found in tobacco (15). Many isothiocyanates, are potent inducers of phase II enzymes in cultured human cells (2, 14). Phase II enzymes are important for protecting cells from DNA damage by carcinogens and reactive oxygen species (16). The genes for these and other phase II enzymes contain a specific sequence of DNA called an antioxidant response element (ARE). Isothiocyanates have been shown to increase phase II enzyme activity by increasing the transcription of genes that contain an ARE (17). Limited data from clinical trials suggests that glucosinolate-rich foods can increase phase II enzyme activity in humans. When smokers consumed 170 g/d (6 oz/d) of watercress, urinary excretion of glucuronidated nicotine metabolites increased significantly, suggesting UGT activity increased (18). Brussels sprouts are rich in glucosinolates, including precursors of AITC and SFN. Consumption of 300 g/d (11 oz/d) of Brussels sprouts for a week significantly increased plasma and intestinal GST levels in nonsmoking men (19, 20). After a cell divides, it passes through a sequence of stages known as the cell cycle before dividing again. Following DNA damage, the cell cycle can be transiently arrested to allow for DNA repair or, if the damage cannot be repaired, activation of pathways leading to cell death (apoptosis) (21). Defective cell cycle regulation may result in the propagation of mutations that contribute to the development of cancer. A number of isothiocyanates, including AITC, BITC, PEITC, and SFN, have been found to induce cell cycle arrest in cultured cells (2). Unlike normal cells, cancer cells proliferate rapidly and lose the ability to respond to cell death signals that initiate apoptosis. Isothiocyanates have been found to inhibit proliferation and induce apoptosis in a number of cancer cell lines (3, 22, 23). DNA is coiled around basic proteins called histones in the nucleus of a cell. Acetylation and deacetylation of nuclear histones is an important mechanism for regulating gene transcription (24). But the balance between histone acetyl transferase and histone deacetylase activities can be disrupted in cancer cells. Compounds that inhibit histone deacetylases may suppress the development of cancer by inducing the transcription of tumor suppressor proteins that promote differentiation and apoptosis in precancerous cells (25). SFN and AITC metabolites have been found to inhibit histone deacetylase activity in cultured cancer cells (10, 26-28). In humans, histone deacetylase activity was inhibited in blood cells following ingestion of 68 g (one cup) of SFN-rich broccoli sprouts (29). Inflammation promotes cellular proliferation and inhibits apoptosis, increasing the risk of developing cancer (30). SFN and PEITC have been found to decrease the secretion of inflammatory signaling molecules by white blood cells; these compounds also have been shown to decrease DNA binding of NF-kappaB, a pro-inflammatory transcription factor (31, 32). Bacterial infection with H. pylori is associated with a marked increase in the risk of gastric cancer (33). In the test tube and in tissue culture, purified SFN inhibited the growth and killed multiple strains of H. pylori, including antibiotic resistant strains (34). In an animal model of H. pylori infection, SFN administration for five days eradicated H. pylori from eight out of 11 xenografts of human gastric tissue implanted in immune-compromised mice (35). However, in a small clinical trial, consumption of up to 56 g/d (2 oz/d) of glucoraphanin-rich broccoli sprouts for a week was associated with H. pylori eradication in only three out of nine gastritis patients (36). Further research is needed to determine whether SFN or foods rich in its precursor, glucobrassicin, will be helpful in the treatment of H. pylori infection in humans. Naturally occurring isothiocyanates and their metabolites have been found to inhibit the development of chemically-induced cancers of the lung, liver, esophagus, stomach, small intestine, colon, and mammary gland (breast) in a variety of animal models (3, 12). Although epidemiological studies provide some evidence that higher intakes of cruciferous vegetables are associated with decreased cancer risk in humans (37), it is difficult to determine whether such protective effects are related to isothiocyanates or other factors associated with cruciferous vegetable consumption (see Cruciferous Vegetables). 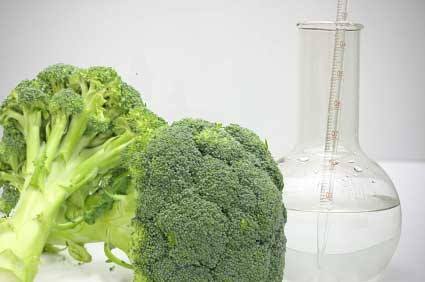 Investigators have attempted to calculate human isothiocyanate exposure based on assessments of cruciferous vegetable intake and measurements of the maximal amounts of isothiocyanates that can be liberated from various cruciferous vegetables in the laboratory (38). Case-control studies using this technique found that dietary isothiocyanate intakes were significantly lower in Chinese women (39) and U.S. men (40) diagnosed with lung cancer than in cancer-free control groups. Assessing dietary intake of cruciferous vegetables may not accurately measure an individual’s exposure to isothiocyanates, since other factors may alter the amount of isothiocyanates formed and absorbed (see Metabolism and Bioavailability above). Measuring urinary excretion of isothiocyanates and their metabolites may provide a better assessment of isothiocyanate exposure (9, 41, 42), but few studies have examined relationships between urinary isothiocyanate excretion and cancer risk. In a prospective study, Chinese men with detectable levels of urinary isothiocyanates at baseline were at significantly lower risk of developing lung cancer over the next ten years than men with undetectable levels (43). A case-control study found that urinary isothiocyanate excretion was significantly lower in Chinese women diagnosed with breast cancer than in a cancer-free control group (44). In contrast, cruciferous vegetable intake estimated from a food frequency questionnaire was not associated with breast cancer risk in the same study. GSTs are a family of phase II bio-transformation enzymes that promote the metabolism and elimination of isothiocyanates and other compounds from the body. Genetic variations (polymorphisms) that affect the activity of GST enzymes have been identified in humans. Null variants of the GSTM1 gene and GSTT1 gene contain large deletions, and individuals who inherit two copies of the GSTM1-null or GSTT1-null gene cannot produce the corresponding GST enzyme (45). Lower GST activity in such individuals could result in slower elimination and thus longer exposure to isothiocyanates after cruciferous vegetable consumption (9). In support of this idea, several epidemiological studies found that inverse associations between isothiocyanate intake from cruciferous vegetables and the risk of lung cancer (39, 40, 43, 46, 47) or colon cancer (48-50) were more pronounced in GSTM1-null or GSTT1-null individuals. These findings suggest a protective role for isothiocyanates that may be enhanced in individuals who more slowly eliminate them from the body. Cruciferous vegetables, such as bok choi, broccoli, Brussels sprouts, cabbage, cauliflower, horseradish, kale, kohlrabi, mustard, radish, rutabaga, turnip, and watercress, are rich sources of glucosinolate precursors of isothiocyanates (51). Unlike some other phytochemicals, glucosinolates are present in relatively high concentrations in commonly consumed portions of cruciferous vegetables. For example ½ cup of raw broccoli might provide more than 25 mg of total glucosinolates. Total glucosinolate contents of selected cruciferous vegetables are presented in Table 1 (52). Some cruciferous vegetables are better sources of specific glucosinolates (and isothiocyanates) than others. Table 2 lists vegetables that are relatively good sources of some of the isothiocyanates that are currently being studied for their cancer-preventive properties. Amounts of isothiocyanates formed from glucosinolates in foods are variable and depend partly on food processing and preparation (see Effects of Cooking below). Consumption of five or more weekly servings of cruciferous vegetables has been associated with significant reductions in cancer risk in some prospective cohort studies (53-55). The amount of glucoraphanin, the precursor of SFN, in broccoli seeds remains more or less constant as those seeds germinate and grow into mature plants. Thus, 3-day old broccoli sprouts are concentrated sources of glucoraphanin, which contain 10-100 times more glucoraphanin by weight than mature broccoli plants (56). Broccoli sprouts that are certified to contain at least 73 mg of glucoraphanin (also called sulforaphane glucosinolate) per 1-oz serving are available in some health food and grocery stores. Glucosinolates are water-soluble compounds that may be leached into cooking water. Boiling cruciferous vegetables from 9-15 minutes resulted in 18-59% decreases in the total glucosinolate content of cruciferous vegetables (52). Cooking methods that use less water, such as steaming or microwaving, may reduce glucosinolate losses. However, some cooking practices, including boiling (5), steaming (7, 58), and microwaving at high power (750-900 watts) (8, 58, 59), may inactivate myrosinase, the enzyme that catalyzes glucosinolate hydrolysis. Even in the absence of plant myrosinase activity, the myrosinase activity of human intestinal bacteria results in some glucosinolate hydrolysis (6). However, several studies in humans have found that inactivation of myrosinase in cruciferous vegetables substantially decreases the bio-availability of isothiocyanates (5, 7, 8). Dietary supplements containing extracts of broccoli sprouts, broccoli, and other cruciferous vegetables are available without a prescription. Some products are standardized to contain a minimum amount of glucosinolates and/or sulforaphane. However, the bioavailability of isothiocyanates derived from these supplements is not known. No serious adverse effects of isothiocyanates in humans have been reported. The majority of animal studies have found that isothiocyanates inhibited the development of cancer when given prior to the chemical carcinogen (pre-initiation) However, very high intakes of PEITC or BITC (25-250 times higher than average human dietary isothiocyanate intakes) have been found to promote bladder cancer in rats when given after a chemical carcinogen (post-initiation) (60). The relevance of these findings to human urinary bladder cancer is not clear, since at least one prospective cohort study found cruciferous vegetable consumption to be inversely associated with the risk of bladder cancer in men (55). Although high dietary intakes of glucosinolates from cruciferous vegetables are not known to have adverse effects during pregnancy or lactation, there is no information on the safety of purified isothiocyanates or supplements containing high doses of glucosinolates and/or isothiocyanates during pregnancy or lactation in humans. Originally written by Jane Higdon, Ph.D., updated Nov., 2008 by Victoria J. Drake, Ph.D., Linus Pauling Institute, Oregon State University. Original site provided by the Linus Pauling Institute at Oregon State University. Robert Ross is not affiliated with or endorsed by the Linus Pauling Institute or Oregon State University. 3. Hecht SS. Chemoprevention by Isothiocyanates. In: Kelloff GJ, Hawk ET, Sigman CC, eds. Promising Cancer Chemopreventive Agents, Volume 1: Cancer Chemopreventive Agents. Totowa, NJ: Humana Press; 2004:21-35. 16. Kensler TW, Talalay P. Inducers of Enzymes That Protect Against Carcinogens and Oxidants: Drug- and Food-Based Approaches with Dithiolethiones and Sulforaphane. In: Kelloff GJ, Hawk ET, Sigman CC, eds. Promising Cancer Chemopreventive Agents, Volume 1: Cancer Chemopreventive Agents. Totowa, NJ: Humana Press; 2004:3-20. 38. Jiao D, Yu MC, Hankin JH, Low SH, Chung FL. Total isothiocyanate contents in cooked vegetables frequently consumed in Singapore. J Agric Food Chem. 1998;46(3):1055-1058. 61. Sulforaphane. Natural Medicines Online Database. 2008. Available at: http://naturaldatabase.com. Accessed October 1, 2008. Original source written 09/05 by Jane Higdon, Ph.D., updated 11/08 by Victoria J. Drake, Ph.D., Linus Pauling Institute, Oregon State University. Introduction by Robert Ross, 10/14 (not affiliated or endorsed by the Linus Pauling Institute or Oregon State University).